It was mid July and as a native Texan, I was cold. No, this is not a misprint, this was July in Uruguay in the midst of the duck hunting season. I was hunting with colleagues, who I prefer to call friends. 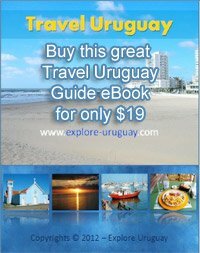 We all into the world of waterfowl and had learned that South America, and more specifically, Uruguay, was a duck hunting paradise. I think anywhere south of 100 degree Texas heat is paradise, so add in duck hunting season and a multitude of South American ducks, and I'm in heaven. Three of us headed to Uruguay for duck hunting last July for a week of duck hunting in the northeast part of Uruguay where rice fields and enormous ranches are spread out to make up the country of Uruguay. Montevideo is the starting point for duck hunting in Uruguay and as the capital it is one of the largest cities in Uruguay. We traveled east , with our final destination at the border of Uruguay and Brazil. The drive time from Montevideo to the duck hunting is about 3.5 hours, but time stands still when driving through the Uruguay landscape where ranch land, sheep, cows, rolling hills, and true Uruguay Gauchos are common and make up the definition and description of Uruguay. The lodge was comfortable and the duck hunting, awesome. in the duck hunting blind, we looked up and saw the ducks coming, a not a small flock but multitude of ducks that reinforced that we were in Uruguay. Rosybill Pochards with bright red beaks, and the colors of the various teal was just amazing. It made me stop to just take in the view, but as a duck hunter, knew it was time to take them! The guides - who were wonderful with their proper Castilian Spanish and good English that was proper for a duck hunting experience, directed us and we came out successful. We had such a great duck hunting day, and saw and shot more ducks in Uruguay than an entire season in North America. We took a break with an asado or South American barbecue that was again a meal I have never experienced and had to pinch myself. The premium beef and various sausage and lamb was all cooked and grilled and the Gauchos were there to oversee and assist with this five star meal in the fields of Uruguay. We enjoyed this meal with some local Uruguay wine and other pastries and accompaniments that can hardly be described, they deserve to be sampled! 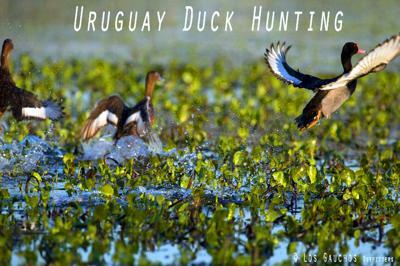 So - take the chance and try the duck hunting in Uruguay. The country, the people, the food, the wine, is all that you want and MORE than you expect.